This highlights report presents selected findings from the full report 'Reporting Australia's results PIRLS 2016'. The Progress in International Reading Literacy Study (PIRLS) is an international study of reading literacy directed by the IEA (International Association for the Evaluation of Educational Achievement). 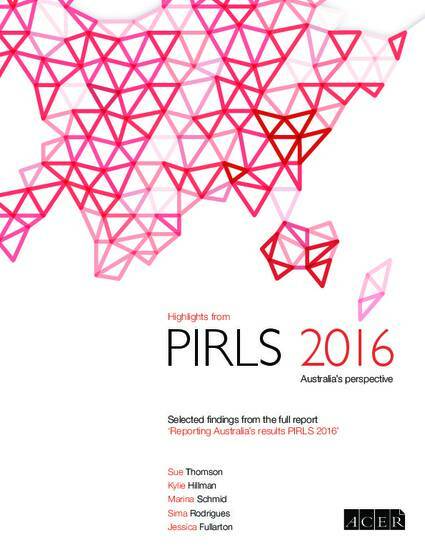 In Australia, PIRLS is implemented by the Australian Council for Educational Research (ACER), which is Australia’s representative to the IEA. In Australia, PIRLS is part of the National Assessment Program. PIRLS has been conducted internationally at Year 4 on a five-year cycle since 2001, however, Australia participated for the first time in 2011. The main goal of PIRLS is to assist countries to monitor and evaluate their teaching of reading across time. Year 4 students are the focus of the PIRLS assessment because they are usually at a key transition point in their schooling, during which they move from learning how to read, to reading in order to learn. PIRLS aims to inform policies and practice while there still is an opportunity to improve students’ performance in reading. Reading literacy is one of the most important abilities students acquire as they progress through their early school years. PIRLS defines reading literacy as ‘the ability to understand and use those written language forms required by society and/or valued by the individual’. PIRLS focuses on three aspects of students’ reading literacy: purposes for reading, processes of comprehension, and reading behaviours and attitudes. This highlights report presents selected findings from the full report 'Reporting Australia's results PIRLS 2016'.